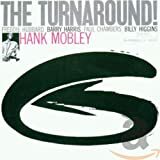 Henry "Hank" Mobley (July 7, 1930 – May 30, 1986) was an American hard bop and soul jazz tenor saxophonist and composer. Mobley was described by Leonard Feather as the "middleweight champion of the tenor saxophone", a metaphor used to describe his tone, that was neither as aggressive as John Coltrane nor as mellow as Stan Getz, and his style that was laid-back, subtle and melodic, especially in contrast with players like Sonny Rollins and Coltrane. The critic Stacia Proefrock claimed he is "one of the most underrated musicians of the bop era."